With its light coconut milk base – no dairy here – this vegan green smoothie is utterly creamy and coconutty. Mango gives it a tropical vibe that makes it taste like a day at the beach. Originally published nearly three years ago on February 28, 2013, this smoothie has remained my favorite, the grand poobah of smoothies. It’s creamy and sweet (but not too sweet), energizing, tastes like a splurge, and it sports a tropical vibe that helps brighten up the darkest winter day. 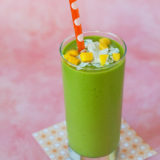 So I thought I’d take some new pictures and re-share this Vegan Mango-Coconut Green Smoothie recipe – my very favorite smoothie recipe! So, I realize I’m several years late to the party here, but I’ve finally discovered yoga. It’s, like, a trip to the spa for a massage. Except you do it yourself, it’s cheaper, and you feel even better afterwards. I’m taking very beginner level classes – no impossible pose attempts in front of depressing mirrors and no hot-yoga blackout episodes, not that I’d know anything about either of those things – and I’m practically giddy over how much I’m enjoying it. “Grace” and “flexible” are about the last two words one would ever use to describe me, but if I keep this up, maybe I’ll get a little closer. So far, it certainly makes me feel great. A blog story about a nice, healthy green smoothie seemed to be the perfect chance to share my yoga discovery. 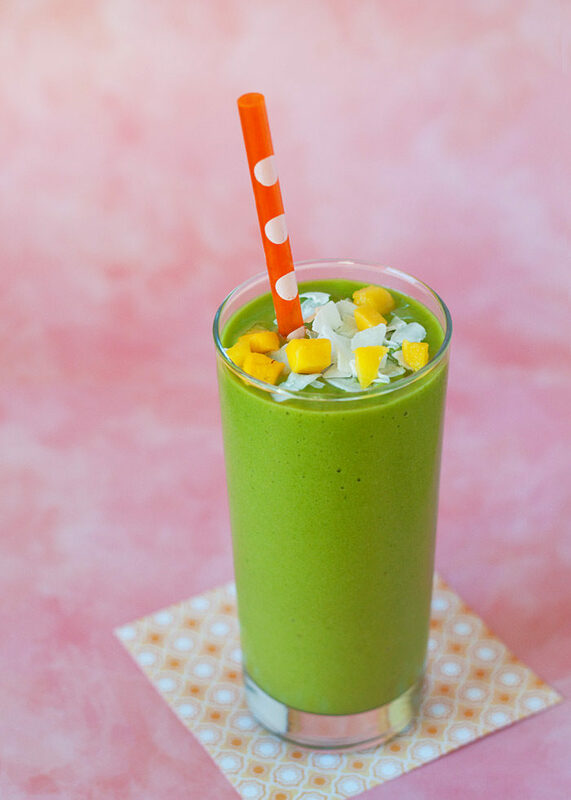 After all, when I come home all loosey-goosey relaxed after yoga class, this mango-coconut green smoothie is pretty much the perfect way to recharge. Smoothies are the best thing ever, aren’t they? They feel like a treat – it’s like drinking a fruity milkshake! – but generally they’re packed with energizing nutrients and guilt-free goodness. If you’ve never tried a green smoothie made with spinach, you’ll be shocked and amazed that you don’t it at all. 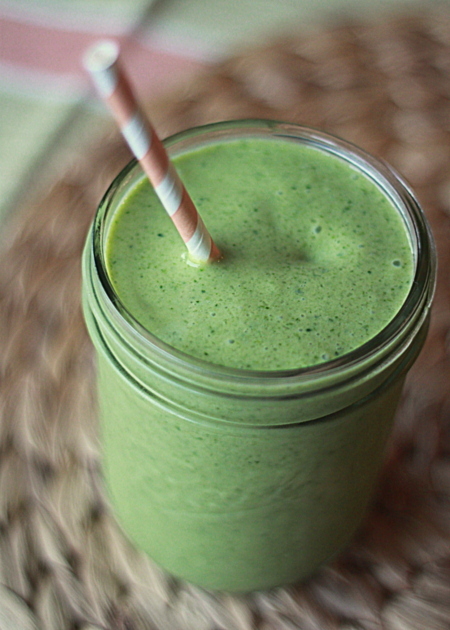 Spinach just makes the smoothie gorgeously green, and, of course, super-healthy. 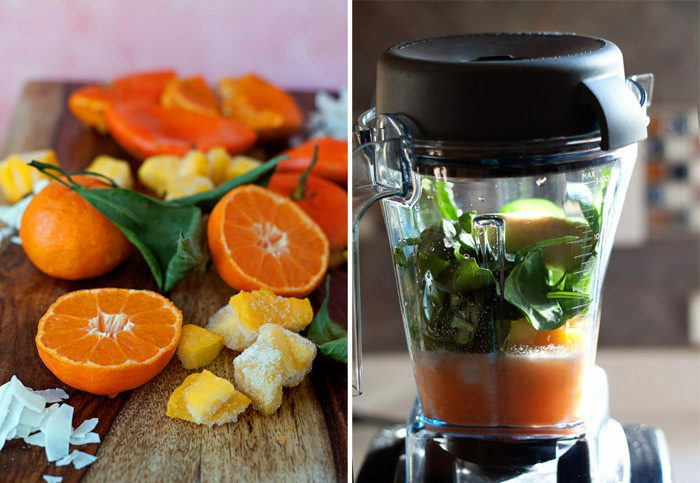 Place all ingredients in a blender and puree until smooth. Pour into glasses, add toppings if desired, and serve with a straw. This looks so good! I love adding spinach to my am smoothies. It turns everything such a pretty green! Seriously, the color makes me smile whenever I drink it! This is MY kind of green smoothie! yum! This was so delicious this morning! Had 6 mangos on hand so perfect. Actually made 8 of these this week! Walked with a couple friends and made them come in for one of these smoothies! That’s awesome. You are a VERY good friend! That’s hilarious! Do you just throw the orange wedges in there? I’ve wondered if that would work/be good, but have never tried it. Yup, I peel the wedges and just throw them right in! 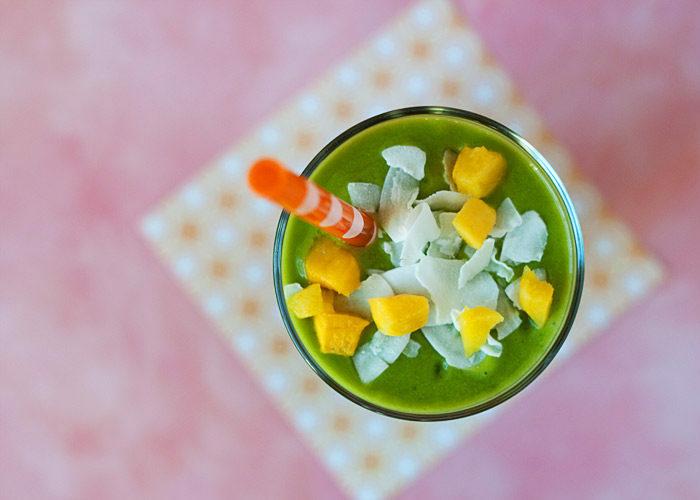 I love green smoothies, and one with mango has me sold!! Sounds so good and so healthy. Great way to start a morning. I love the looks of this smoothie. 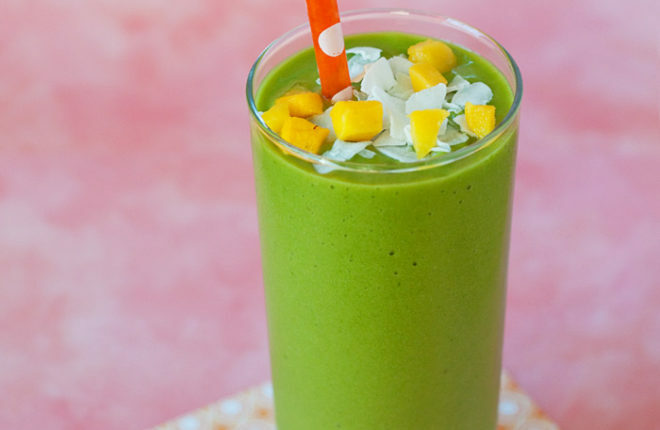 With the coconut water, spinach and flaxseed it must be packed with nutrients. Congrats on discovering and enjoying yoga! I am pregnant and found this recipe looking for nutritious smoothies that wouldn’t make me nauseous. I omitted the banana (I don’t like my smoothies too thick) and used fresh grapefruit juice instead of orange (didn’t have any on hand) and it tastes great! Not too sweet but still indulgent. Thank you so much! Hi Kayla, I’m so glad you liked it! I know all too well how hard it can be to find something you can stomach when pregnant. Congratulations to you! I just made this! Sipping on it currently and LOVE it! I needed to use my (expired) bag of spinach, so i put the whole bag in the blender with coconut WATER (14 oz), then added mango, 1/2 banana, coconut OIL, chia seeds and 2 ice cubes. I was so nervous that I wouldn’t like it. BUT I DID!!! it made quite a bit, a whole Mason jar, plus a full 8 oz. glass. Coincidently, I have been doing yoga for almost 20 years (congrats on joining the party) and have been drinking green smoothies from Whole Foods, but there was something about DIY that made me think I wouldn’t like it. Even though it tastes good, I’m still hesitant to do more of this, but with encouragement and recipes like yours, I’m sure I will be a blending Queen before too long. Thank you for the inspiration!!! I realize that this recipe is not new, but somehow in my travels through the internet, I stumbled upon it. I have always loved smoothies but have been afraid of going green. I don’t know what it was about this recipe, but I thought I would finally take the leap, and I am SO GLAD that I did. This recipe is wonderful. I make it all of the time now. As a busy student, it’s really great to know that I am having a big burst of nutrition. I add chia seeds or hemp hearts to mine. To anyone on the fence or scared of green- MAKE THIS! It takes like tropical sunshine in a glass and absolutely nothing like the liquified salad that I was fearing. Thanks for the awesome smoothie recipes! I tried this one and was amazing! Thanks for sharing! I made this but substituted coconut water for the OJ and it still came out fantastic and not too sweet. This will definitely be in my smoothie rotation. This is my first Green juice/ smothie… I was relucant to try on and i went searching and i found this one!! For mine i put a little bit more of coconut milk because i used a mango that isnt matture yet (i love it like this) so it was to sour to my tasting. I was looking for a healthy and tasty smoothie recipe when I finally found yours and I tried it today! It tastes absolutely amazing, nothing like I was drinking before that sometimes even made me gag. I’m so so so thankful! I finally found the one – it tastes amazing and is also healthy! Maybe it’s a little too sweet for my liking but I’ll try to add less mango next time. Thank you!